Wholesale Trader of a wide range of products which include ph bench and ion bench meter, laboratory desiccator, soil ph & moisture meter and display ph meters. We bring forth to our clients a wide range of pH Meter Bench and Ion Bench Meter which is specifically designed to meet the various requirement in Laboratories & Educational Institutes. Further, these are available with us in different model to meet the various industry requirements. 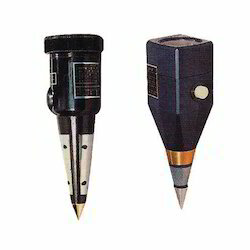 These are known for features like high accuracy, precise construction and longer service life. 0.001 1000/ GLP 232 .O.R. We offer a wide range of Laboratory Desiccator, imported from reliable and trusted vendors from overseas markets. 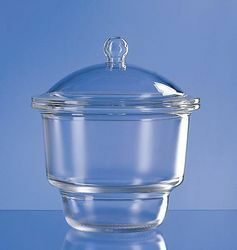 These are sealable enclosures which contain desiccants and are used for preserving moisture-sensitive items. Owing to their reliable performance, these find their application areas like protection of hygroscopic chemicals which can easily react in humid atmosphere. Soil pH value is a very important factor in the production of quality crops. Most crops, cannot survive in soil that is too acid or too alkaline. Therefore the correct pH reading is essential to achieve optimum results. Moisture: 1 - 8(10%–80%) . 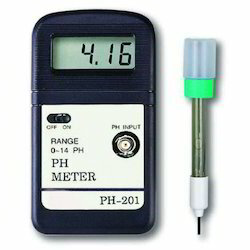 Accuracy : ± 0.2 pH-Suitable for agricultural field and classroom experiments. Operating Temp: 5-50°C (41-122 Degrees Fahrenheit). Remove any obstruction to the soil that requires testing, such as surface soil, grass, leaves,pebbles, etc. If the soil is dry or contains too much fertilizer, sprinkle some water onto the soil and leave for 25-30 minutes before testing. Before using the tester, be sure to thoroughly clean its metallic surface with a piece of whetting cloth. When using a brand-new tester, we advise you to insert it into the soil a few times before taking your reading. This is in order to remove any oily impurities from its metallic surface that may affect the accuracy of your soil pH or moisture reading. Insert the meter directly into the soil that requires testing, embedding its metallic surface completely and tamping down the surrounding soil so that it adheres closely to the meter’s metallic electrode surface.About ten minutes after inserting the meter in the soil, the pointer will indicate the correct value of pH or moisture.The meter may sometimes register different values depending on the soil condition, adhesion to the meter’s metallic surface, moisture content, etc. Therefore it is advised you take an average of several measurements. Press the white/green button and the pointer will indicate the correct moisture value. Do not leave the metal part of the tester in the soil for too long (no longer than one hour) or it will damage the metallic surface. Make sure the metallic surface is clean and dry before storing. Do not use the tester near magnetic objects, and keep it away from other metallic objects. Do not measure liquid. This tester is not designed for measuring liquid. Do not hold the tester with fingers on metallic surface. Fingerprints are greasy and reduce the flow of current. HI 98184 and HI 98185 are waterproof, portable meters designed for demanding applications. 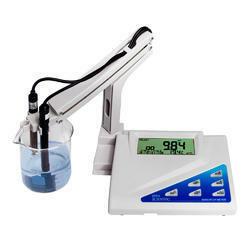 HI 98184 and HI 98185 measure pH/ORP/ISE and temperature. HI 98185 supports 15 different ISE sensors by default and can be calibrated in up to five points and 6 standard buffers (choice of units). This unit allows an extensive choice of measurement units (ppm, ppt, g/L, ppb, μg/L, mg/mL, M, mol/L, mmol/L, % w/v, user) and has an expanded measuring range of 1.00 x 10-7 to 9.99 x 10-10. HANNA's Calibration Check™ maintains a history of past calibrations and monitors the pH electrode and buffers during subsequent calibrations for any signs of wide calibration variances due to a dirty or broken electrode or contaminated pH buffers. In measurement mode, the electrode's percent condition is continuously displayed. Looking for pH Meter Bench and Ion Bench Meter ?